Home75th Anniversary of ‘Bambi’ Brings a Special Meet & Greet to the Parks and PhotoPass Exclusives! We all love that classic from Walt Disney “Bambi” and it is celebrating it’s 75th Anniversary this year. To help in the celebration Walt Disney World’s Animal Kingdom is offering a very Special Disney PhotoPass opportunity from August 25 through the 27th. 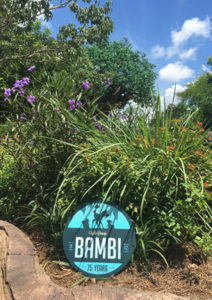 During this time you will be able to make your way to Rafiki’s Planet Watch and meet some special Disney Characters you do not normally get to meet, Thumper and Miss Bunny! These are two characters that never really get much guest interaction anymore and it will be nice to see them smiling for the camera once again. All you need to do is head on over to Animal Kingdom and go in front of the Conservation Station from 10:20AM through 4PM and get those photos taken. There will also be some “Special” PhotoPass options with some Magic Shots available adding Bambi and others to your photos and into the mix including a fantastic looking Butterfly one with it sitting right there on your hand.